Posted March 1, 2017 by Josette Farrell in News. Claregalway Festival of Drama will be officially launched tomorrow night Thursday 2nd March in the Claregalway Hotel. 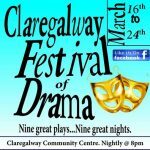 This year’s Festival of Drama will commence on Thursday, March 16th and will conclude on Friday 24th in Claregalway Community Centre. The festival will commence on the eve of St. Patrick’s Day with DADS Dunmore and their production of ‘The Odd Coupld’ by Neil Simon. On Frida, March 17th Dalkey Players will present ‘Dead Man’s Cell Phone’ by Sarah Fhul and on Saturday Doonbeg Drama Group will present ‘The Night Alive’ by Conor McPherson. 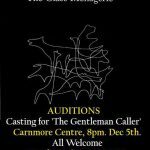 On Sunday, Glenamaddy players will present ‘The Bog of Cats’ by Marina Carr and on Monday Corofin Players will present the highly acclaimed Martin McDonagh play ‘The Cripple of Inishmann’. On Tuesday, March 21st Ennis Players will present ‘The Colleen Bawn’ by Dion Boucicault and on Wednesday, Phoenix Players present ‘The Third Policeman’ by Flann O’Brien. On Thursday 23rd March local Claregalway – Carnmore Drama Group and last year’s All Ireland Confined winners Compantas Lir will present ‘The Birds’ by Conor McPherson and on Friday March 24th Claregalway Festival of Drama wil condlude when Corn Mill Theatre will present the popular Brian Friel production ‘Philidelpia Here I come”. 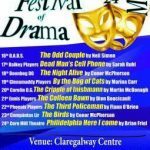 Claregalway Festival of Drama is a wonderful showcase of amateur drama in Ireland and is not to be missed.